Ellen Page, is that you? 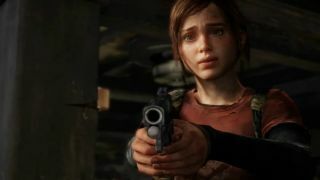 The PS3 is set to benefit from PS4 development as the "play while downloading" feature makes its way onto Sony's current console with the release of upcoming survival title The Last of Us. It's one of the PS4 features TechRadar is most excited about, promising gamers the ability to get into the action without the annoying thumb twiddling. Gamers will only have to download 50 per cent of the game when it hits the PSN store on June 14 before they can get started on what we're expecting to be one of the big hitters of 2013. While it's good news for those who have been drooling over every last morsel of footage since the game's 2001 reveal, we're actually expecting the PS4 to let us play games when even less than 50 per cent has been downloaded to the console - "just a fraction" said Sony. Still, halfway is good enough for now, and while we might still be waiting to find out what the PS4 actually looks like, we'll be just that extra bit ready for it now when it arrives. The other question right now is: will the Xbox One also announce 'play while downloading' functionality to games during the big reveal tomorrow?